PYRO-ENERGEN : Why You Should Buy? Most electrotherapy or electromedicine devices known and used today are injecting electric current to the body or to the blood. They claim that electric current is a good remedy and can help several kinds of diseases. Other forms of electrotherapy are available such as Frequency Generators, Scenar, Ultrasound, Pulsed shortwave diatehermy, Interferential therapy, TECAR therapy, and Laser therapy. However, none of them can eradicate the origin or cause of disease. All of these, once the frequency, voltage, current, flux and rays are overused or given in overdose, may damage the skin and organs or side effects may appear. How then can one treat or cure these diseases caused by the side effects of so-called modern electrotherapy? It is because no one found the cause or origin of disease. And these treatments are not cure but "remedy". There are several kinds of high-tension voltage therapeutic machines that are available either AC or DC in the world market. Some of them are patented and approved by the Ministry of Health in Japan and Food and Drug Administration of USA. However, many prohibitions are incorporated with these machines. The Japanese Ministry of Health also prohibits applying more than 9000 volts as it will do more harm than good. Don't you know that high-tension voltage of AC (alternating current) induces Joule heat in the body and will cause even death? Unlike any other existing electromedicine or electrotherapy devices, PYRO-ENERGEN uses "negatively-charged static electricity"and is applied with very different and unique technology. It is called "static" because there is no current flowing as in AC or DC electricity. Probably, modern medical science has never imagined and applied the beneficial effects of PYRO-ENERGEN technology. Thus, there are no side effects at all even you use the machine the whole day and night. 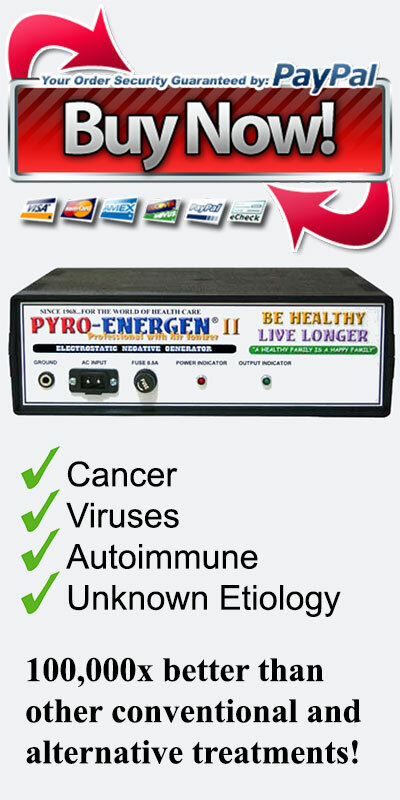 The best and beautiful part of the PYRO-ENERGEN is its efficacy and being well-suited for CANCER treatment, and unlike other machines that have long list of prohibitions, you can use PYRO-ENERGEN without any worries at all. Remember, true treatments will not harm healthy people, and will only make them healthier. Eliminates all viral diseases, cancer, and diseases of unknown cause, including respiratory diseases caused by allergies. Healing Result is Instantly Observed. No Side Effects and Impossible to Overdose With—You can use it during menstruation, pregnancy, or after childbirth. 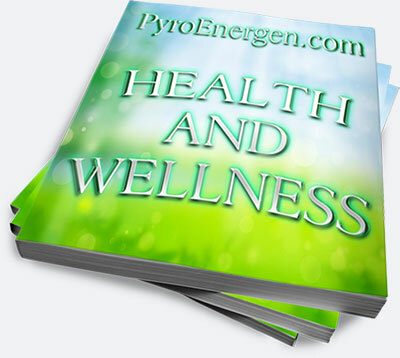 The use of PYRO-ENERGEN is not only intended for ill persons. Healthy children and adults are also recommended to use PYRO-ENERGEN to safeguard and maintain good health. Rejuvenates and Strengthens the Immune Systems. Lightweight and Easily Transportable. Only 2 kgs. It is very economical. It consumes few watts of electricity so you no need to worry about your electric bills.